Eagle Superabrasives Glass Grinding Wheels, are developed by our very own team of engineers to ensure high-performance grinding. With an extensive inventory of over 6,000 diamond, CBN and CDX wheels in stock at our Hickory, NC, location we can ship ninety-percent of orders same-day. Custom orders can be shipped in as little as seven days. Typically our Glass Grinding Wheels are made to order. 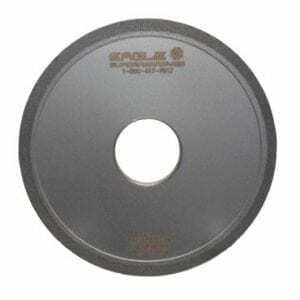 We recommend our diamond grinding wheels when working with glass, they offer precise clean cuts with an optimal life span. We use two types of bonds with our glass grinding wheels, metal and resin bonds. Metal bond wheels are typically selected because they are extremely resistant to the grinding fines that are produced while grinding glass and ceramics. These grinding fines can erode resin bond glass grinding wheels causing shorter wheel life. Metal bonds do not suffer this issue nearly as badly as resin bonds. Why Diamond Grinding Wheels when cutting glass? Diamond is the hardest material known to man and synthetic diamond is hardest man-made material. Due to their hardness, they are used for various grinding purposes. Every material is rated on Moh’s scale of hardness. The hardness is reference to the resistance of certain minerals to scratching. Moh’s scale uses ten minerals to determine hardness. Diamond is rated as 10 for hardness on the scale and glass is rated 5.5. So any material that is within the range of 5.5 to 10 can be used to cut glass. Since diamond is the hardest, it offers a precise clean cut and is very durable when grinding. Grinding glass is typically done under flood coolant to help the removal of the grinding swarf and to prevent the clogging of the wheels pores. For questions regarding glass grinding wheels or another superabrasive product, contact the experts Eagle Superabrasives. With an expert staff, you can expect unparalleled customer service, give us a call. Our experienced staff is dedicated to providing our customers with high quality products and unequaled service. We offer experienced technical support and advice to assist you along the way.